I didn't grow up in Chinatown. Neither did my mother and father. My ancestors didn't come to North America to pan for gold or build the railroad. No one in my family paid a head tax. Chinatown was just a place we visited every weekend to stock up on supplies. Even still, this neighbourhood, this community, this place we call "Chinatown" has become very near and dear to my heart. Pender Street leading through the Millennium Gate in Vancouver Chinatown with the Sun Tower in the background. My earliest memories of Chinatown are of picking oranges under a red canopy, the smell of citrus staining my fingertips. A splash of fishy water on my face, as my aquatic friend and soon-to-be-dinner slaps its cold, lean body against the currents trying to escape an incoming net. The flesh of a juicy lychee on my tongue as I beg my mother to bring home a bunch -- a sweet dessert after a hot summer day in Toronto. Grocery shopping on a Sunday with my family. I didn't grow up in Chinatown. Neither did my mother and father. My ancestors didn't come to North America to pan for gold or build the railroad. No one in my family paid a head tax. Chinatown was just a place we visited every weekend to stock up on supplies. Even still, this neighbourhood, this community, this place we call "Chinatown" has become very near and dear to my heart. Wherever I am in the world -- whether its San Francisco, New York, Paris, Milan, Barcelona, or Vancouver -- I cannot resist its pull. Like the temptation of a juicy pork shiu mai calling to me on a hungry Sunday morning, I gravitate to this place at every opportunity. When I'm a tourist, I scan the constellation of roads and landmarks on a map and make certain I've set aside a day for exploring Chinatown. 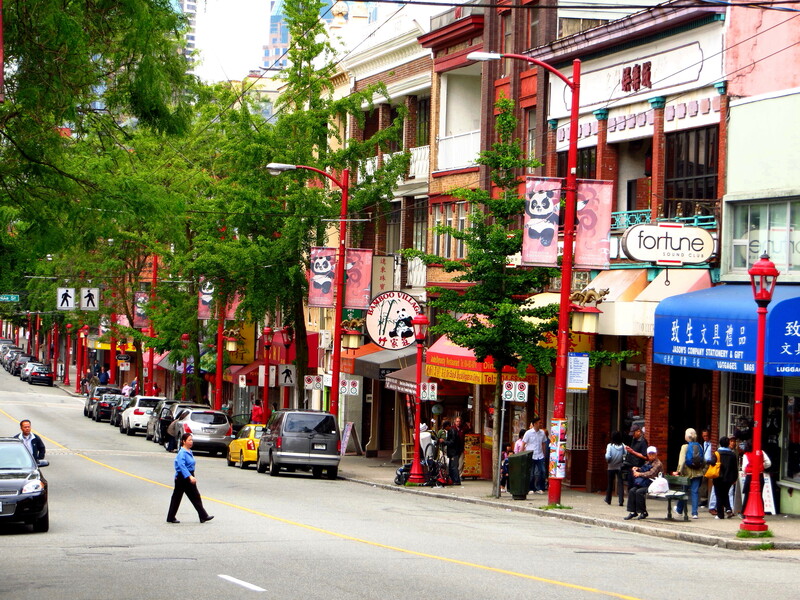 At home in Vancouver, my partner and I recently settled into a home within walking distance of the city's historic Chinatown so I can visit whenever I want. What draws me to this once-thriving but now gritty neighbourhood marred with poverty, drug use, dilapidated housing, and stinky sidewalks? Recently I've been having to explain myself to a lot of people, including my good friend Hanna, a recent immigrant to Canada from Beijing. Hanna told me she was so frightened by her first experience in Vancouver's Chinatown that she actually went and bought pepper spray in case she'd one day be forced to walk through the neighbourhood again. "It's nothing like China and it doesn't resemble Hong Kong at all," Hanna told me. "I was chased down the street by a man my first week in Vancouver. I don't feel safe there." I understood why she felt that way. 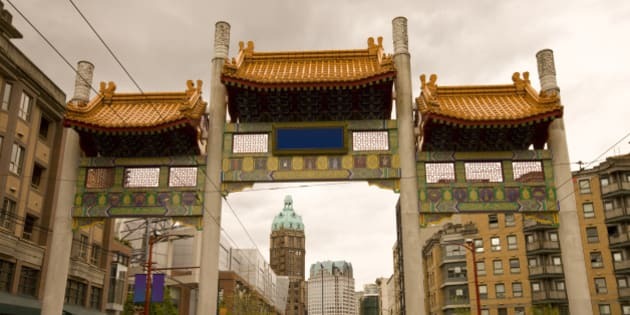 While Vancouver's Chinatown remains a popular tourist attraction and one of the largest historic Chinatowns in North America, it has been in decline for decades ever since the Chinese community dispersed to other areas of the city. But I've come to see Vancouver's Chinatown very differently. Like many ethnic enclaves in North America, Chinatown is a place that enlivens my senses, sparks my curiosity, and tempts me with the promise of good food. It's a place that brings me comfort yet oddly tests my boundaries. I always explore Chinatown on foot, even in the rain. I say "zhou sun" (good morning) and exchange pleasantries with the aging waitresses who have been working at the same restaurant on Pender Street -- Chinatown's main strip -- for decades. My husband and I sip oolong tea and share a table full of bamboo steamers; we are the youngest people in a rabble of Cantonese-speaking seniors. I wander in and out of stores, listening to the drums rumble from the open balcony of a martial arts training centre and for the laughter of children when the doors burst open, freeing them of Saturday morning Chinese school lessons. By early afternoon, my two-wheeled cart is bulging with goodies when my nose leads me to a nearby café for a cup of lemon tea and a pineapple bun, a soft buttery taste of heaven baked with a crunchy yellow sugar topping. The next time Hanna is in Chinatown, I tell her to look up. Pender Street is lined with several storeys of historic tenement buildings. Some of them are crumbling and they are all very old, but take a look at those pillars, those balconies, those colourful facades. Aren't they beautiful? Many of them are chiseled with the year they were erected and Chinese characters tell us the names of numerous clan associations, benevolent societies, and schools. But what if this history isn't your history? Why should you care? A student at the University of British Columbia once interviewed me for a project about Chinese-Canadian history. She admitted she found it difficult to connect with stories about early Chinese migrants. Her family, like mine, had come to Canada much later and she felt unattached to the history lessons in her textbooks: Early Chinese migrants to Canada were not permitted to reside outside of Chinatown or hold professional jobs. In B.C., employers were punished for hiring Chinese workers and the Chinese were forbidden to vote in provincial elections. And in Vancouver, a curfew was imposed on the Chinese population after sundown. I told the student we should care because it's important to learn about the origins of community. It's important to recognize what so many before us endured, so that we can enjoy our present-day freedoms. Canada is what it is today because of them, and we need to remember that history to appreciate the present. Recently I took a tour of the Wing Sang Building, one of the oldest buildings in Chinatown, and learned that the Chinese built secret lane ways and tunnels so the community could continue to interact and thrive after the imposed curfew. The only curfew I was ever subject to was one set by my own Tiger Mother when I was a young student. How inconsequential my protests now seem when I think about the inequality and institutionalized racism early migrants faced. On a recent night, I brought Hanna to a screening of Julia Kwan's documentary "Everything Will Be" -- a beautiful film that captures Chinatown's transformation through the intimate perspectives of new and long-time residents, merchants and entrepreneurs. The screening was held at the Dr. Sun Yat-Sen Classical Chinese Garden in Chinatown (one of my favourite spots in the city) and when we arrived, Hanna was surprised to see such a diverse audience fill the room. Most of the people there were not Chinese. At the end of the screening, Kwan asked someone in the audience to share a memory of Vancouver's Chinatown with the group in exchange for a prize. A woman of Italian descent raised her hand and talked in vivid detail about how her grandmother liked to celebrate every single family occasion at an old restaurant in Chinatown. That restaurant has been closed for years now, the woman said, but she was left with wonderful, warm memories of a neighbourhood she considered her own. "You see, Chinatown isn't just for the Chinese," I told Hanna as we left the screening that night. "Chinatown belongs to all of us."